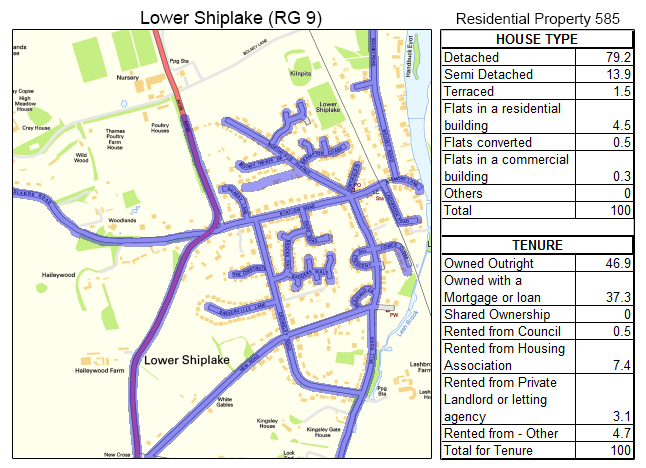 For cost-effective and reliable GPS tracked leaflet distribution Lower Shiplake RG9, Shareplan Leaflet Distribution can offer you a complete service. Shiplake is a village situated on the River Thames, about three miles south of Henley-on-Thames. The Wargrave and Shiplake Regatta, which is held annually, is the second largest regatta on the Thames after the Henley Royal Regatta. Shiplake was also home to George Orwell, the author of the famous novels Animal Farm and Nineteen Eighty-Four. Through our geoplan map we know the total number of residential delivery count is 585. About 94% of these properties comprise of detached, semi-detached and terraced houses. This data can help you position your product and services to the targeted demographic audience like offering home insulation services to increase energy efficiency, or offer surveyor services to calculate the rebuild cost of homes. Our Lower Shiplake door-to-door flyer distribution service is second to none. The entirety of our flyer distribution is carried out using a GPS device. Our team will send you a report on completion of the flyer delivery round and it will take you only moments to download the data and view the exact route the flyer distributor took to deliver your material. In addition to providing reliable and trustworthy leaflet distribution in Lower Shiplake, we can also offer a demographic targeting service to ensure you are delivering to the right target audience. You can give us particular estates in an area in Oxfordshire, for example, and we will provide a report and map showing the number of residential deliverable properties. Your leaflet design is integral to ensuring your door-to-door flyer distribution campaign is as successful and effective as possible. We highly recommend using our free one-to-one consultation which gives you the ideal opportunity to meet with one of our in-house marketing experts. After all, we want your campaign to be as successful as possible because the more successful you are, the more successful we are! If you are struggling to decide where you want to start with your leaflet delivery campaign, you can even use our graphic design service. Our in-house design team will help you get the most from your direct response marketing. Of course, our exceptional leaflet delivery service wouldn’t be complete without giving you the chance to get incredibly low prices on your leaflet printing! Get a discount on your door-to-door flyer distribution when you order both your leaflet printing and leaflet delivery from us! Our door-to-door flyer distribution is available in all the main towns in Oxfordshire including: Henley-on-Thames, Sonning Common, Goring, Woodcote and Whitchurch. Please feel free to take a look at our other coverage areas and also visit our FAQ if you have any other unanswered questions.